Sometimes it's the most simple and classic things that make the biggest impact! This black maxi dress is the perfect wardrobe staple that can be worn dressy or casual, depending on how you accessorize. The V Dip Strappy Back Black Maxi Dress is fully lined and made of a slightly textured fabric. It has a V dip at the neckline with boning for support. Double spaghetti straps on each side of this dress add an extra cute touch. A lace up detail at the back of this dress adds to this cute look, and a hidden back zipper completes this dress. The V Dip Strappy Back Black Maxi Dress is perfect to pack on vacation! It looks great dressed down with gold sandals and jewelry for a chic look. Or wear it casually while traveling with a denim jacket or cardigan. You can dress it up with strappy heels for a more formal occasion--this is a great multi-purpose dress you'll wear again and again! Details: Fully lined. Hidden back zipper. 96% polyester, 4% spandex. Lining: 100% polyester. Hand wash cold. Do not bleach. Hang or flat dry. Low iron. Small measurements: Length from top of shoulder to hemline: 56". Bust: 32". You have added V Dip Strappy Back Black Maxi Dress into Wishlist. You have added V Dip Strappy Back Black Maxi Dress for Stock Notification. 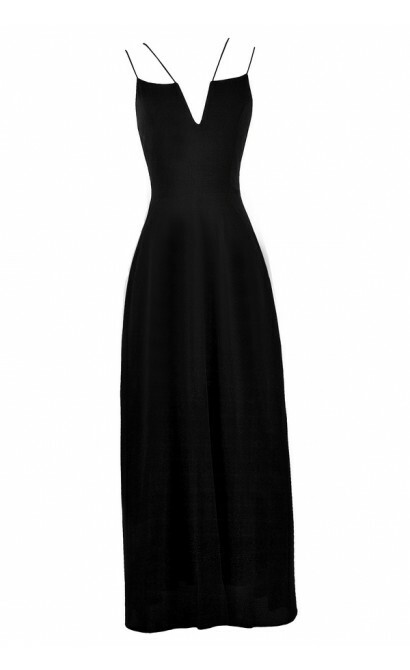 You have set V Dip Strappy Back Black Maxi Dress as a loved product. 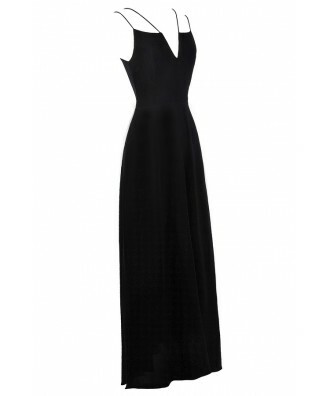 You have removed V Dip Strappy Back Black Maxi Dress as a loved product.